If you are either starting up or scaling up your business (particularly in a new territory or market), you may want to consider first appointing an agent or distributor to promote and/or sell your goods and/or services, in order to gain entry into a market, drive sales or gain recognition for your brand. In addition to agency and distribution, you may have already considered options such as a joint venture, or franchising as your channel, as well as direct sales and online presence. In this blog we’ve outlined the legal distinctions between, and commercial benefits and drawbacks of appointing agents or distributors to help you make your decision about what works best for your business. In the context of this blog, you can identify yourself as the supplier. 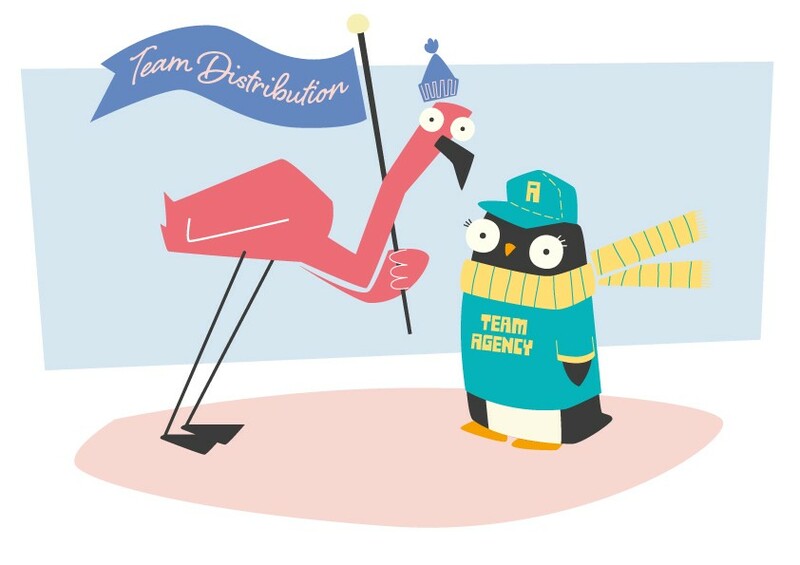 What’s the legal difference between an agent and a distributor? In broad terms, one party (the principal), appoints another party (the agent) to introduce customers to the principal and/or to make direct sales on the principal’s behalf. In doing so, the agent is given authority to negotiate (and sometimes) enter into contracts on behalf of the principal, usually in return for a commission on the sales concluded through the agent’s efforts. Legal ownership of any products concerned does not pass to the agent, and legally, each customer’s contract is with the principal not the agent. Therefore the principal assumes legal and commercial risk whereas an agent (normally) does not. A distributor is essentially a purchaser of the supplier’s products, which it then sells on to end-user customers. Legal ownership to the products concerned passes to the distributor and it, not the supplier, has the contractual relationship with any customers. Although agency and distribution have the same commercial objective (i.e. to sell a supplier’s goods and/or services to customers), their structure and legal effects differ as set out in the table below. incentivise its contractor — an agent earning commission on sales may be more motivated than a distributor. However, it can be difficult to control the agent’s day-to-day activities and to make sure that they continually work hard on your behalf. The agent has a degree of legal authority to bind the principal and could incur liability for the principal. Also, on termination of the agreement, agents can be entitled to compensation even if they breached the agreement. to avoid the administration of multiple customer relationships for particular products/markets, and to have only one, with the distributor. 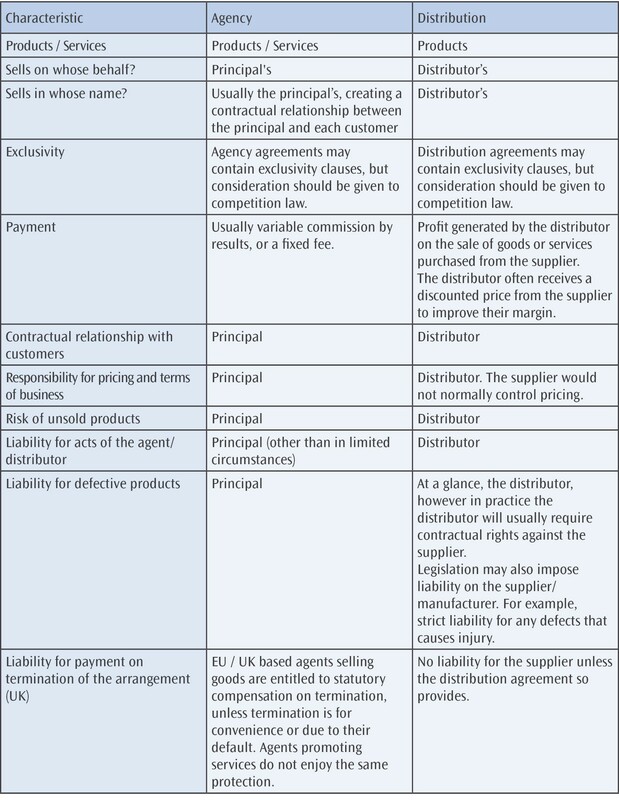 Note that a supplier will have less control over the activities of a distributor than it would an agent and is unlikely to have a direct relationship with the end-user customer. Whatever you decide is best for your business objectives and plan, ensure that you have the full facts about the legal and commercial impact, as your supply chain and channels are vital to your growth and ultimate success.